On World Stroke Day, Niagara Emergency Medical Services, the Heart & Stroke Foundation of Canada and Niagara Health are teaming up to ensure that more lives are saved from the effects of stroke. 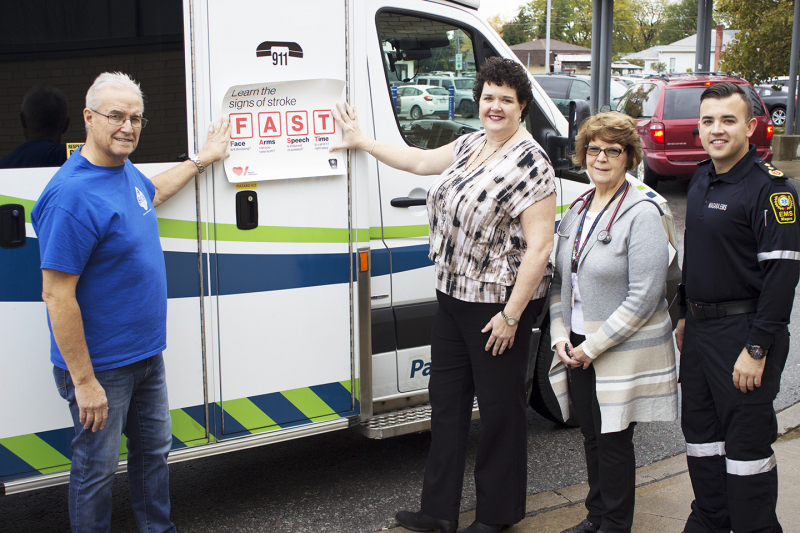 Niagara EMS will raise awareness of the signs of stroke and the importance of acting quickly by placing decals with the signs of stroke acronym ‘FAST’ on their ambulances. The FAST acronym is an easy way to remember the five signs of stroke: Face: Is it drooping? Arms: Can you raise both? Speech: Is it slurred or jumbled? Time: To call 911 right away. The ability to recognize the FAST signs of stroke and calling 9-1-1 can mean the difference between life and death, or the difference between a full recovery and lasting disability. Niagara District Stroke Centre, based at Niagara Health’s Greater Niagara General Hospital, was recently recognized for the speed of its care. 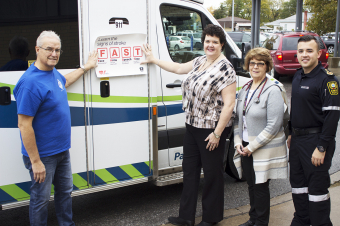 “I’ve heard that showing FAST on TV and in advertisements has proven to be effective and would support it being on all ambulances in the Niagara Region,” said stroke survivor Laura Stronghill. 83 per cent of people who have a stroke and make it to hospital will now survive. Brain cells die at a rate of 1.9 million per minute during stroke. Stroke is a leading cause of acquired adult disability.